No! Not the Music Keys!! Back in 2005, Konami and Nintendo surprised us all by announcing they were teaming up to release a new entry in the Dance Dance Revolution universe starring characters from Nintendo’s flagship series, Super Mario Bros. Most people will go into this not expecting the complete foot-burning DDR experience, and it’s these people in particular that will be satisfied with what Konami have done with this title. For those unfamiliar with the Dance Dance Revolution experience, it’s quite simple. You choose a song to your liking, and when the song starts, arrows will appear from the bottom of the screen and scroll upwards. You will have your own arrows at the top of the screen, and when the scrolling arrows pass over the top, you will need to execute a nicely timed step in that direction on the dance mat: the higher a combo you can string, the greater your score for the end of the song. It’s an easy concept to pick up but, in the greater difficulty levels especially, can be quite difficult to master. In a first for a Mario game, Waluigi takes a prominent role in the storyline, and if the story is anything to go by in this game, will probably be the last time he gets involved. You see, he’s stolen the Music Keys which apparently contain the power of music! He’s then somehow managed to wrangle the chaotic power of music to cause floods, whirlpools and other disasters. Oh dear! As weak as the story is, you’ll want to play through it to unlock all the music for the standard DDR mode, which while not as hard-as-nails as other DDR games can get, comes as a very satisfying experience for Nintendo fans and DDR fans alike. Konami have obviously gone into this title wanting to introduce a new batch of gamers to the DDR universe, as Easy mode does not utilise the Up and Down arrows whatsoever, meaning veterans will scramble to skip straight to the Hard and Very Hard modes. The game contains a total of 29 tracks, standard fare for the DDR series, although one a nice touch tells you the song name, the game it appears in and what original track it was based off, though not all songs are game-related. 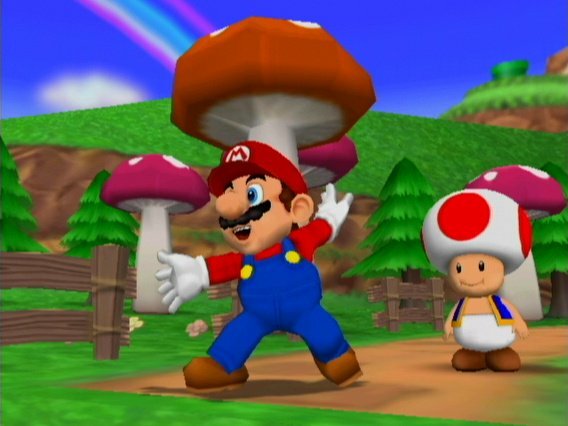 For example, “Here We Go!” is based on the Overworld music of Super Mario Bros., while “Pipe Pop” is based off the classic Mozart tune “Turkish March”. There is enough variety in the music that there should be something for everyone, but we can’t help but feel a few dance versions of other Nintendo properties would have been a nicer touch. 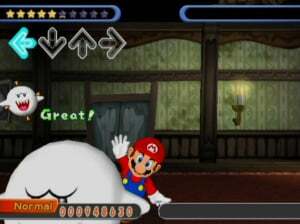 Included in the game and exclusive to this release is the advent of Mush Mode. 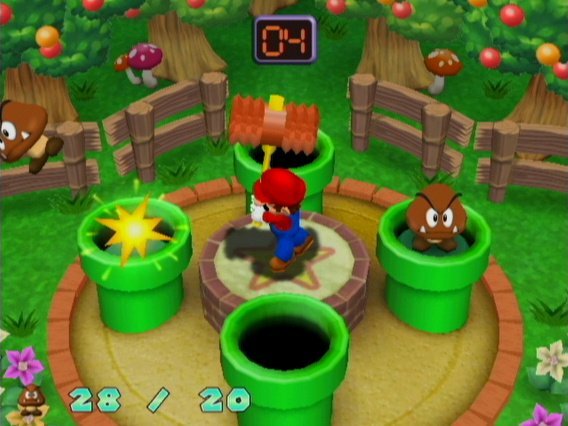 Acting as a minigame inside a standard dance, some levels will have you step twice on a Koopa Trooper in time to the beat, others will have you stepping on the appropriate arrow to send a Bob-Omb at your opponent. There is a nice variety and it really adds to the experience and gives you something different to do when you get sick of stepping on arrows. At the time of release, the only way to enjoy multiplayer Mario Mix would have been if you had a friend who also got a Mario Dance Mat with their game, or if you ordered a second one through Nintendo’s online store. With the release of DDR: Hottest Party 1 and 2 on the Wii, this doesn’t pose as much of a problem as it did. Multiplayer Mario Mix in Mush Mode (or MMM in MM for short!) is a joy to play, and worth delving into if you’ve got a couple of dance partners. The less intimidating difficulty of the dance routines makes multiplayer more accessible for lesser abled friends and family members. 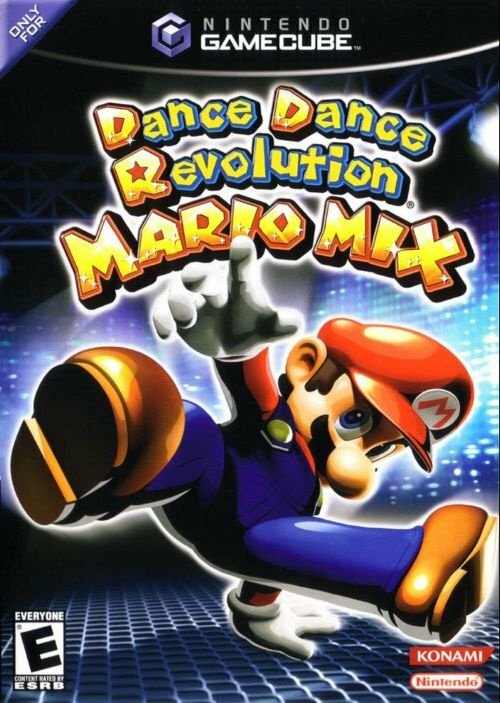 While it's not likely to give you callouses on your feet, Dance Dance Revolution: Mario Mix offers a fun introduction to the DDR universe, with a selection of tracks which might not be the strongest in the series, but do the job well enough. If you're a fan of Dance Dance Revolution, or just a fan of the Mario series in general, this is definitely worth a go. Wow, I forgot about this one. What a weird little experiment this was. I'll be damned. You CAN make DDR look even more ridiculous. just dont let anybody see you playing it. Or get drunk and have a party and see everybody making fools of themselves. I loved this game, still need to play the more difficult settings. I own this game but I haven't played in years. Recently bought a new disk for 20 bucks because my old one was so scratched. I have my pad and game sitting in the corner of my room... may even begin playing through the story again today! Only problem is, you literally can't play it on a second floor unless you like pissed off people below you. Thankfully I'm on ground. Holy frack, how brilliant, lol. Lordy! It's back! Maybe I'll get this! I totally play this game at least three times a month. While I do also have the first DDR, DDR Konamix, and DDR Max, I love this game as well. Ramping the difficulty all the way up and playing Bowser's Castle is a blast without being too crazy difficult. this game was out for like 2 weeks! Awesome game and my first DDR experience. I haven't played it in a long time though. I loved the music in it and I hope they'll make a sequel some day with more Nintendo music. I actually have this game. Kinda felt too kiddy for me. At least you get to play as Luigi with 2-Player mode! Yeah the music is terrible, haha. But it's fun for kids. This game should have added Peach & Daisy as characters for the ladies that like to dance on this Nintendo DDR game. I like this game! IMO, the music is great, and the challenge is just fine. In fact, the idea that other DDR games are harder is frightening. Never thought I'd see a review for this game on here! Really good remixes in this game. Great for beginners but now isn't the "best" DDR game for beginners. That so goes to HP3. I remember this... Was a bit odd at first, but was pretty funny to see the Mushroom Kingdom get down! I want to try and get my hands on this game sometime too. I've always wanted to try a DDR game- what better for a Mario fan to start with a Mario DDR then? ..I didn't even know this existed! Good review, Chunky. I liked this game years ago. It's fun to dance on the mats. The song selections are great. I've never beaten Bowser's Castle on Super Hard, but I did beat it on Very Hard and every other song on Super Hard, so the difficulty was just perfect for me. My cousins have the dance mat, but not the game. This game got me into DDR. After this I bought a PS2 and then over time, every DDR game available on that platform (I don't have X2, though.) This didn't happen when the game was released. I picked it up much later, when the Wii was around and, I'm proud to say, I paid $5 for it at kmart. I really loved this game. OK, so the story mode is boring and you have to play it in order to unlock songs, but the songs in this are great if you love Nintendo music, and it is a great introduction to DDR. If you are an expert you probably aren't going to find much to like here, but even an intermediate player will find plenty to hold their attention for quite a while. I still can't complete Bowser's song (I forget the name offhand) at the highest difficulty. The gimmicks are a mixed bag, but IMHO they are better then the gimmicks in Hottest Party 2 (I don't have 3 yet). In any case you can turn them off, and a nice thing is it keeps separate high scores for with and without the gimmicks. The one big problem with this game, though I didn't know it at the time, is the lack of modifiers, in particular no ability to change the speed of the arrows. It's a lot easier to play songs with lots of steps when you increase the arrow speed to 1.5x normal. That way it's easier to distinguish them as they are further apart instead of all crammed together, even though they are moving faster. Of course there aren't a lot of songs like that in this game, but there are some that would benefit from it. Otherwise, though, I put this up there as one of my favorite DDR games. because it only has a very boring selection of songs. only mainstream dance versions of classical tunes and Mario songs. which is not good in this one. I still have this, though its a long time since I played it... Mario's dancing is pretty funny at times as his body is so small - a lot of crazy wrist action and the, er 'grinding' in this one is just odd! You don't need two dance mats to play multiplayer. One person could use a normal controller. Although I suppose that wouldn't be enjoyable. This game is worth it just to watch Bowser breakdance. While the song selection isn't the best, there are still some enjoyable tracks in the game. Minna de Party Time is probably my favorite track. I really wish Nintendo would stop being so cheap and use more licensed music in their music games or if Konami could've volunteered some of their in-house tracks for the game. Regardless, I found the dance mat to have been of pretty good quality. The game is not brilliant but its also not a total waste. And as others have mentioned, it could definitely stand to be a bit tougher. It may be easier than most DDR games but maybe thats why i enjoyed it. It could be a tad better with more music. Music games need downloadable content. It's funny, but IMHO, this game has the best music of any DDR game I've played. For me, the standard type of dance music in DDR games is really pretty atrocious stuff, but I'm fine with it because it works for a dance game, so it's good in that context. That is a matter of taste, obviously. The Nintendo music in DDR MM is awesome, and I'm really glad it doesn't have your standard DDR fare - that wouldn't have worked for this game at all. Obviously, though, your mileage may vary in that regard. I really like this game. I haven't played it in a long time though because the awesome dance mat it came with broke. That one never slid or anything! Okay, serious question: Are the dance pads for the Hottest Party games compatible with this? I got my girlfriend Hottest Party 3 recently and when I mentioned this game's existence, she immediately wanted to play it.